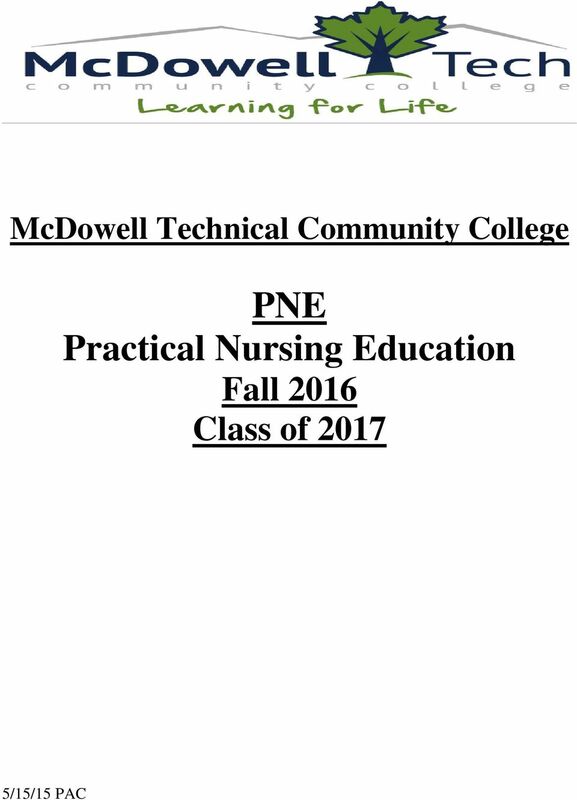 Download "McDowell Technical Community College PNE Practical Nursing Education Fall 2016 Class of 2017"
3 from the program. In accordance with the NC General Statute applicants for initial licensure in North Carolina must have a criminal background check. Applicants with criminal convictions may have limited licensure and employment opportunities. *The clinical agency reserves the right to refuse someone with a criminal record the use of their facility. General Admission Requirements: 1. Applicants must submit a completed admissions application obtained from the Student Services Office. 2. Applicants must have a high school diploma or equivalent. An official high school transcript or General Education Development (GED) certificate must be sent to the college. Student copies of these items are not acceptable. 3. Official transcripts of all previous post-secondary education must be requested by the applicant and sent directly from the forwarding institution to the college. Student copies are not acceptable. *The minimum required GPA is 2.0. * 4. Applicants must attend a mandatory nursing information meeting before deadline (schedule of meetings will be provided). 5. 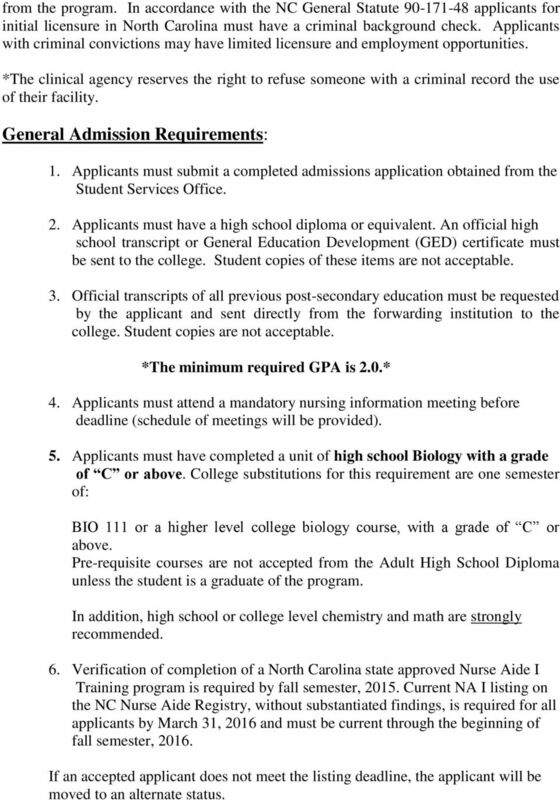 Applicants must have completed a unit of high school Biology with a grade of C or above. College substitutions for this requirement are one semester of: BIO 111 or a higher level college biology course, with a grade of C or above. Pre-requisite courses are not accepted from the Adult High School Diploma unless the student is a graduate of the program. In addition, high school or college level chemistry and math are strongly recommended. 6. Verification of completion of a North Carolina state approved Nurse Aide I Training program is required by fall semester, Current NA I listing on the NC Nurse Aide Registry, without substantiated findings, is required for all applicants by March 31, 2016 and must be current through the beginning of fall semester, If an accepted applicant does not meet the listing deadline, the applicant will be moved to an alternate status. 5 religion, or handicap. For further information, refer to the MTCC catalog section entitled Non-Discrimination Policy. **Accepted applicants who are unable to attend the orientation session due to extenuating circumstances must notify the Nursing Program Director and complete all orientation requirements by August 1, An accepted applicant who fails to meet orientation requirements will forfeit his or her place in the PNE program. Required Courses Students may take these general/related (non-nursing) courses before acceptance into the nursing program or before the specified semester. 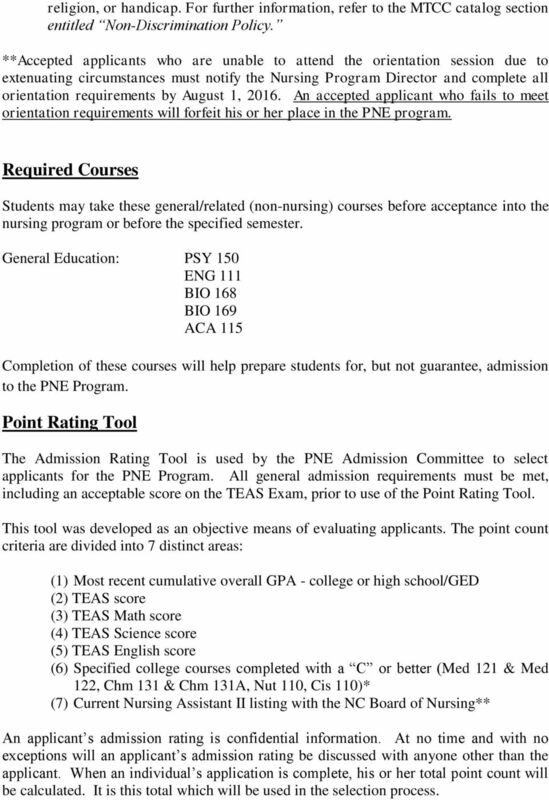 General Education: PSY 150 ENG 111 BIO 168 BIO 169 ACA 115 Completion of these courses will help prepare students for, but not guarantee, admission to the PNE Program. Point Rating Tool The Admission Rating Tool is used by the PNE Admission Committee to select applicants for the PNE Program. All general admission requirements must be met, including an acceptable score on the TEAS Exam, prior to use of the Point Rating Tool. This tool was developed as an objective means of evaluating applicants. The point count criteria are divided into 7 distinct areas: (1) Most recent cumulative overall GPA - college or high school/ged (2) TEAS score (3) TEAS Math score (4) TEAS Science score (5) TEAS English score (6) Specified college courses completed with a C or better (Med 121 & Med 122, Chm 131 & Chm 131A, Nut 110, Cis 110)* (7) Current Nursing Assistant II listing with the NC Board of Nursing** An applicant s admission rating is confidential information. At no time and with no exceptions will an applicant s admission rating be discussed with anyone other than the applicant. When an individual s application is complete, his or her total point count will be calculated. It is this total which will be used in the selection process. 6 Please do not call to inquire about your point count. If you are accepted, you will be notified of your acceptance as outlined in Selection Process outlined on the next page. In the event of an identical score for ranking, TEAS V test scores will be used to differentiate tie scores. 1. First preference will be given to the applicant(s) with the highest TEAS science scores. 2. In the event of a tie in TEAS science scores, preference will be given to the applicant(s) with the highest TEAS math scores. 3. In the event of a tie in TEAS math scores, preference will be given to applicant(s) with the highest TEAS English scores. *Extra points are given for specified college courses with a C or better, but are not required. **Extra points are given for having current NA II Certification, but NA II Certification is not required for acceptance in the PNE Program. Admission criteria are reviewed each year and are subject to change from year to year. 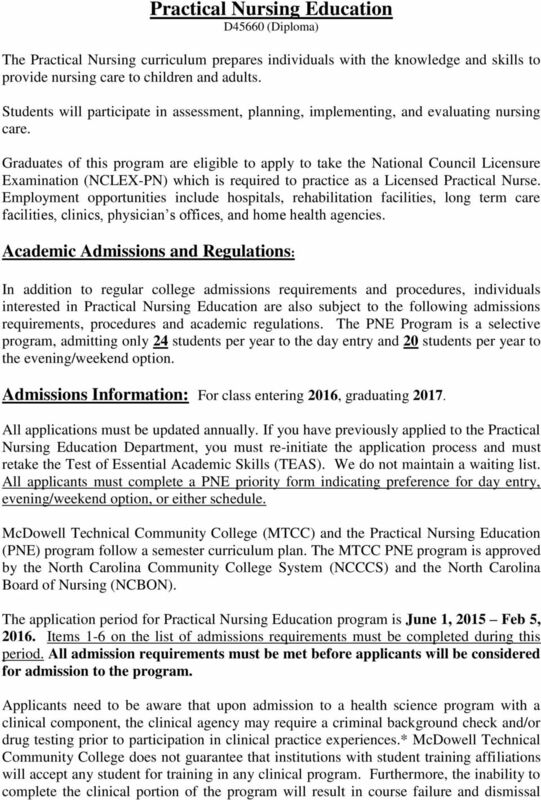 Graduates of the PNE Program are eligible to apply to take the National Council Licensure Examination (NCLEX-PN) which is required to practice as a Licensed Practical Nurse. Selection Process Deadlines 1. General admissions requirements (# s 1-6) must be met. Feb 5, Written notification will be mailed to eligible students Feb 12, 2016 regarding dates and times to sit for the TEAS (Test of Essential Academic Skills). 3. 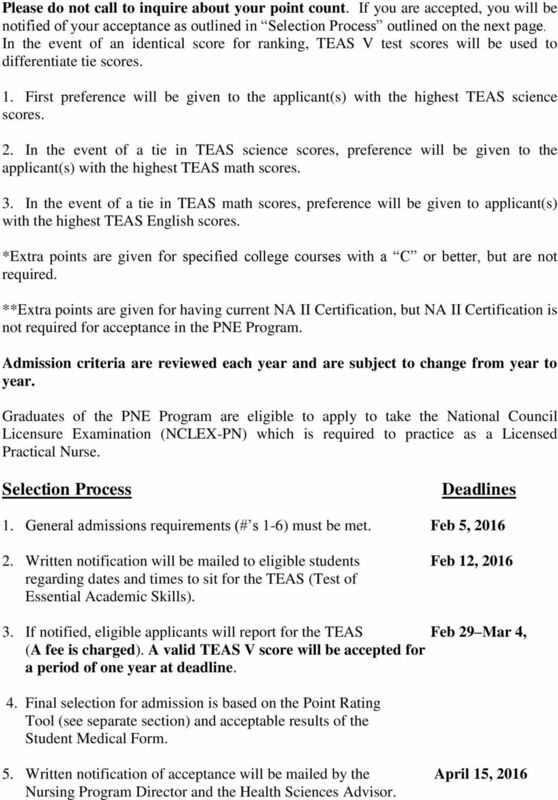 If notified, eligible applicants will report for the TEAS Feb 29 Mar 4, (A fee is charged). A valid TEAS V score will be accepted for a period of one year at deadline. 4. 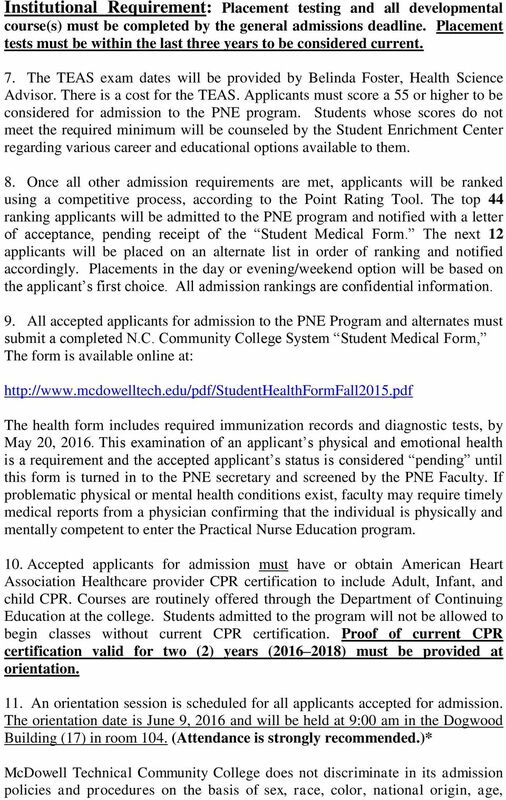 Final selection for admission is based on the Point Rating Tool (see separate section) and acceptable results of the Student Medical Form. 5. Written notification of acceptance will be mailed by the April 15, 2016 Nursing Program Director and the Health Sciences Advisor. www.gtcc.edu An Affirmative Action/Equal Opportunity College NURSING APPLICANT ADMISSION INFORMATION 014 NOTE: Associate Degree Nursing (ADN) and Practical Nursing (PN) are limited enrollment programs. LPN to ADN Online Option Admission Information & Requirements. 2. Hold a current unrestricted LPN license in North Carolina (or compact state). Section I. Introduction Diman Regional Technical Institute Practical Nursing Program Admission Policy The Practical Nursing Program offers a full-time day, part-time day, and part-time evening program.